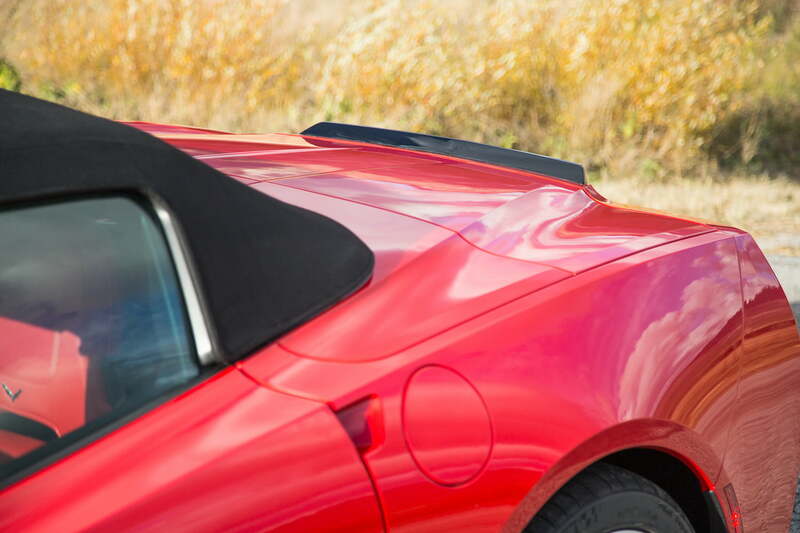 Chevrolet’s Corvette Stingray Convertible combines American muscle with lightweight, cutting-edge technology to create the most youthful and modern Corvette to-date. I tapped impatiently on the steering wheel with a sigh as I surveyed the gorgeous desert scenery around me. I was idling on the side of the road in a brand-spanking-new muscle car, stuck in a conference call. I had mistakenly scheduled it at the same time I was supposed to be speeding through the mountains outside Palm Springs, California in the 2014 Chevrolet Corvette Stingray Convertible. Voices crackled through the speakers of the bright red drop-top, sounding almost otherworldly, after being transferred through multiple speakerphone systems, across a continent, and into the Corvette’s infotainment system. “Nick, does that sound alright to you?” Micah, my Editor in Chief, asked. “OK that’s fine,” Micah said. I pushed the seven-speed manual into first and gunned it. Quickly, the roar of the 6.2-liter LT1 V8 drowned out the echo-y tones and murmurs of the conference call. Turn after glorious turn, as I raced into the mountains, I could see the cell signal icon on the Chevrolet MyLink screen, that was Bluetoothed to my phone, drop precipitously. I paused for a moment, as I saw the last bar of signal flicker on screen and then die out. The “Lost Call” warning jumped up on screen. You feel a party to the combustion process, creating hydrocarbons simply for your auditory pleasure. I let off the accelerator. “I could get in trouble for missing out on this call,” I thought. Right then, my iPhone reverted back to the iPod function and AC/DC’s “It’s a Long Way to the Top (If You Wanna Rock ‘N’ Roll)” began blasting. I punched the accelerator, dropped the clutch and drifted the Stingray up the mountain. The sound of the all 455 fiery horsepowers being churned out inside the cylinders of the LT1 V8 is a miraculous and overwhelming thing, especially in a convertible. You feel a party to the combustion process, creating hydrocarbons simply for your auditory pleasure. “Worth it!” I yelled as I passed 100 mph on the windy mountain pass. This moment is one that will live with me forever. A brand-new, red-on-red, American convertible muscle car, a high-power V8, a manual transmission, rock ’n’ roll pouring from the speakers, and nothing but blue skies and windy, perfectly paved roads ahead of me. The C7 Corvette Stingray, as you might well know by now, is the most radical change in the Corvette lineage, perhaps ever. It has an all-new aluminum structure, lightweight body panels made not just from composites but also from carbon fiber. 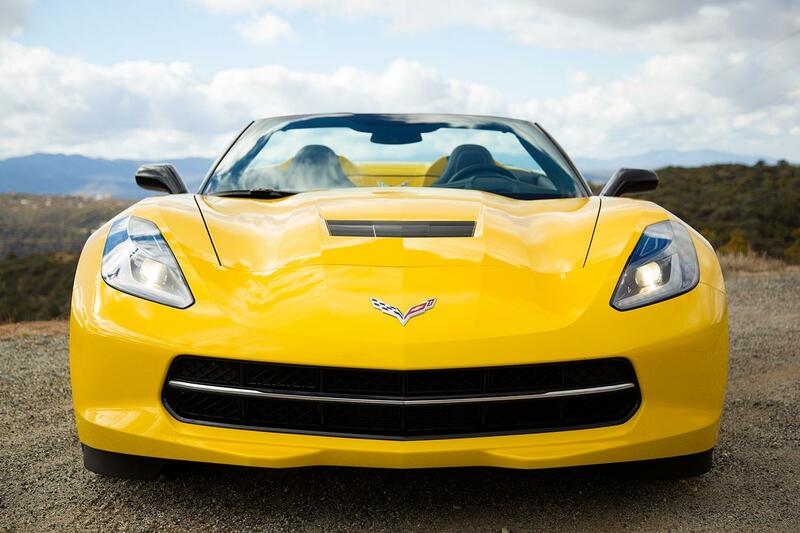 The Stingray Coupe and Convertible were designed side-by-side from the outset. The design team wanted to ensure that the visual cleanness of the Coupe wasn’t lost in translation into drop-top form. Accordingly, every bodyline was considered for both forms, ensuring both were striking without compromise. In fact, Chevrolet engineers brag that the Stingray Convertible is stiffer than the McLaren MP4-12C Spider. They admit, though, that McLaren might measure things differently. 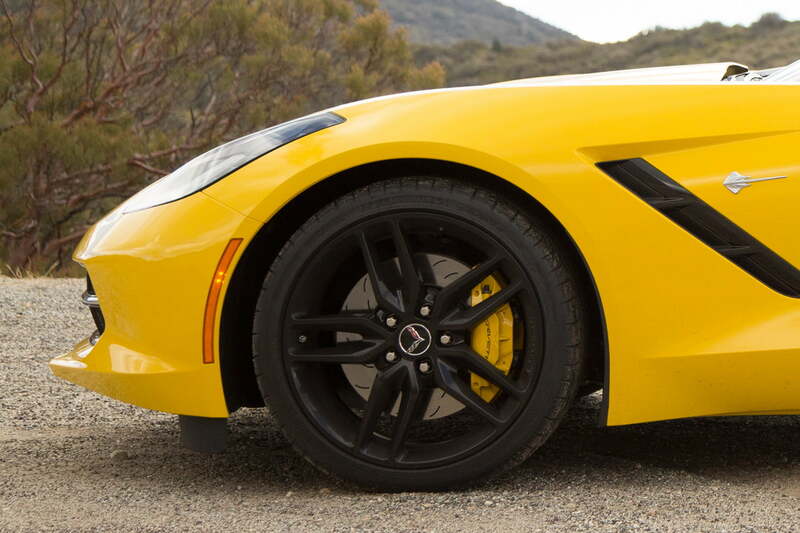 By Chevy’s metrics, though, the Stingray is more rigid than the McLaren. The body structure isn’t the only new, lightweight bit. Chevrolet opted for the simple-but-lightweight pushrod V8, rather than a heavier, more modern V8 with four overhead camshafts. With direct injection, variable valve timing, and cylinder deactivation, the Stingray produces 455 horsepower and 460 pound-feet of torque but also 17 mpg city and 29 mpg highway. Backing up that rumbly V8 is either a rev-matching seven-speed manual transmission or a six-speed automatic with paddle shifters. It’s very keen mix between soft touring car suited for an old man and a modern day road racer. This, mind you, is the standard Stingray. Opt for the Z51 sport package, and the specs get even more impressive. With a sport exhaust, horsepower is pushed up to 460 and torque up to 465. The engine lubrication system is upgraded to a dry-sump unit. Chevy also fits a differential and transmission coolers, and an electronically controlled limited-slip rear differential. Special brakes, wheels, and tires are also added. 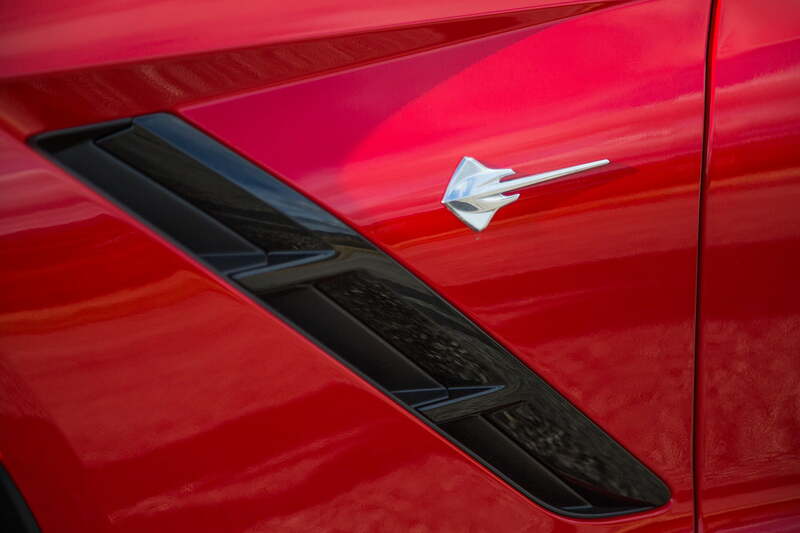 Then Chevy finishes the Z51 Stingray off with an aerodynamics package to improve downforce and road grip. The Z51 will go like lighting to 60 mph in 3.8 seconds, complete a quarter-mile run in 12 seconds, reaching 119 mph, achieve 1.03g in cornering, and come to a slamming stop in 107 feet. Of the packages and options, I most preferred the sport exhaust and the Magnetic Ride Control suspension. The standard suspension is OK. But if you’re going to drive with any sort of conviction, the Magnetic Ride Control is a must. As for the sport exhaust, it lets you hear what’s really going on underneath that long, shapely hood. After “It’s a Long Way to the Top” looped for the third time, I switched off the stereo and just enjoyed the sound of the wind whipping by and the guttural sounds of the sport exhaust. The Stingray Convertible I drove first was a standard unit. No special suspension, no Z51 package, just red-on-red. I let off the throttle a bit and took a moment to study the interior. For the first time, the Corvette feels like a modern car, like a car someone under 75 years old would actually want to own. The digital instrument cluster has more settings and themes than I care to list here. The eight-inch MyLink infotainment touch-screen responds easily and quickly to all commands. Chevy also cleverly designed a storage cubby behind the MyLink screen, accessible by lowering the display. Just like on the Jaguar F-TYPE, the dash line that starts over the instrument cluster runs over the infotainment screen and drops down to the right of the center stack, creating a handle for the passenger to grab during a frightening situation. Materials, fit and finish, and overall quality of the Stingray Coupe and Convertible are light years ahead of their predecessors. The seats are comfortable and supportive but thankfully no longer like a pair of recliners. 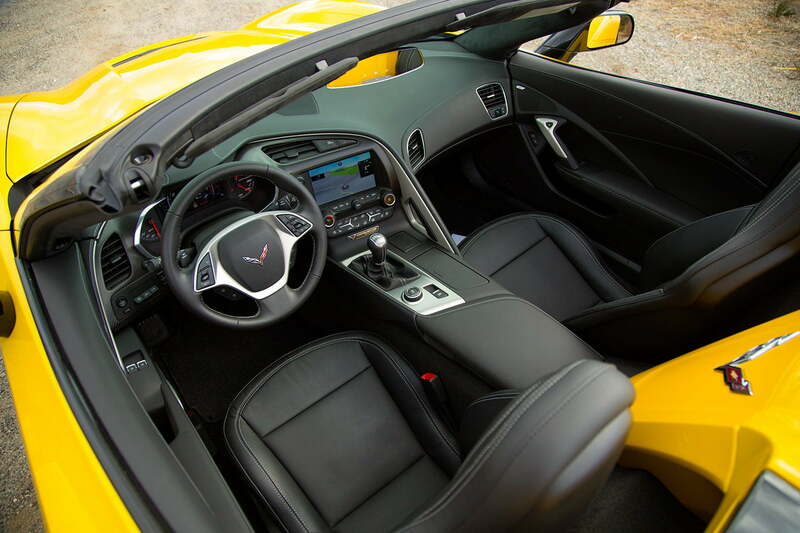 Corvette designers used real carbon fiber and real aluminum throughout the interior. 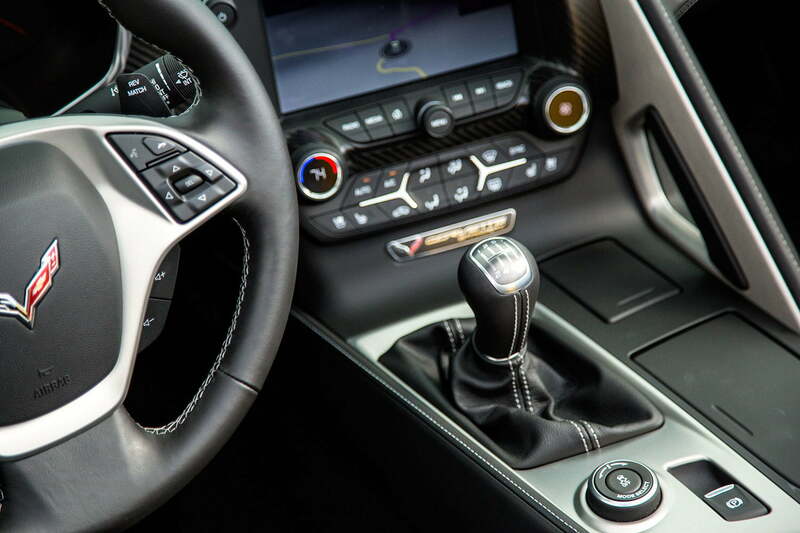 The Stingray interior isn’t just nice by Chevrolet standards; it’s nice on European supercar standards. Cresting the boulder-covered desert mountain range and coming back down the other side, I decided to get back into the throttle. Turning into a corner, the standard suspension is firm enough to keep you feeling planted and confident at virtually any speed. Over rough bits of road, though, it also has enough give, enough cushion, to smooth out roadway imperfections. It’s very keen mix between soft touring car suited for an old man and a modern-day road racer. Like I said before, I do prefer the Magnetic Ride Control suspension upgrade. But if you’re not going to track your ‘Vette, you’ll find the normal setup pleasurable. Blazing down the mountain, I was driving very sportily indeed. I never felt, though, like I was at either my or the Stingray’s edge. I was throttling hard and braking harder. Eventually, as I wound my way down into the valley, I began to smell brakes. As the mountain wound down, though, the brakes became more and more squishy. I let off them a bit more, using the seven-speed to slow the car, hoping to cool the brakes enough. Suddenly, I came to a sharp left-hander. I came in hot and had to stab the brakes. Nothing. I pushed harder. Nothing. I stood on them and the car did nothing. The right rear wheel went into the dirt and gravel on the outside of the road and my heart fluttered as the Stingray drifted toward the 1,000-foot drop-off. “Here we go, I’m going to lose her,” I thought. I gritted my teeth and turned harder. Luckily, I made the corner. I’ll give credit not to my own bravery but to the stiff new aluminum chassis. This hair-raising moment, too, will live in my consciousness for the rest of my life. I really do feel that I was inches away from wrecking the Stingray Convertible, seemingly to no fault of my own. If you follow this site at all, you’ll know I’ve driven many high-performance cars in much more rigorous conditions. I still don’t feel I was expecting more from the Stingray than I should. I don’t feel I rode the brakes too long. I think that hill, that road, and those speeds, were more than the standard Corvette could handle. In retrospect, I find it amusing that I had one of the most heartening driving experiences of my life behind the wheel of the Stingray and, no more than 30 minutes later, had one of the most frightening. While I would have rather not had a near-death experience, it helps put the new American muscle car into some perspective. The more I learn about the time, technology, and care that went into creating the Stingray, the more in awe of it I become. 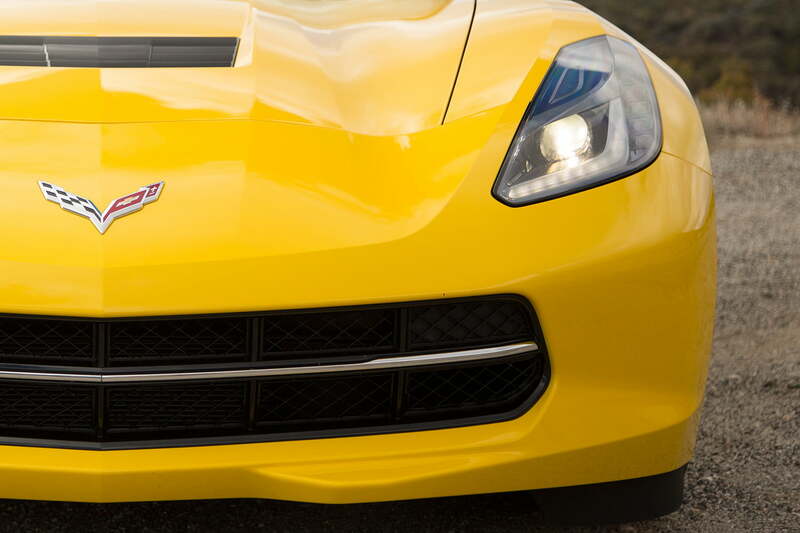 For the last 40 years, the Corvette has been a weird old man’s car. A car for when your cholesterol and bank account exceed the six-digit mark. This new one is different, though. The Stingray is packed with high-tech wizardry that rivals Germany’s finest. It’s been sculpted with care and a keen eye that puts the English to shame, too. And it can go toe-to-toe with the Italians on the back roads – at least in Z51 form. Sure, it’s not perfect. But it’s the closest thing to perfection that Chevrolet has ever created. Most importantly of all, though, it’s a car that a young man like me would be proud – and not in any way embarrassed – to own. If I were to get one, though, I’d make sure to get the Z51 package with the brakes and the extra cooling flaps. ‘Cause, boy, if you’re like me, you’re going to need ‘em.